Olive Tapenade Recipe - It's one of the omega 3 foods! This is a classic, black olive tapenade recipe that gives you enough, 2 ½ cups, for a small party or as a spread for sandwiches for a long time. It keeps refrigerated for up to a month. Tapenade comes from the French word tapeno which means caper. If you make it without capers, perhaps in France anyway, it could be called olivade. Here in the U.S. when we think of tapenade we think of olives. Olives are probably the oldest cultivated fruit. And no wonder, they are so good for you! The olive is a great source of monounsaturated fat and a good source of iron, vitamin E and dietary fiber. The most flavorful olives to use for this tapenade are Kalamata or Niçoise pitted olives. Olive tapenade can be spread on low glycemic, whole grain crackers or if you’re having a party you could make crostini out of a baguette that you have sliced thin and toasted. For your sandwiches toast sprouted whole grain bread, cut off the crust and add a little olive oil to the bread, lettuce and sliced tomato. Place the olives, anchovies, garlic, and capers in a food processor and chop into a coarse paste. Add the lemon juice and oil and continue processing until coarsely mixed without turning into a purée. Now it is ready to spread on crackers or sprouted grain toast. 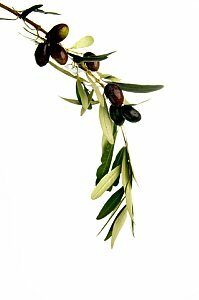 * If you can’t find Kalamata or Niçoise olives in your grocery store you can substitute another mild, unseasoned olive. Many people assume that because tapenade is a rich spread you should not eat it if you need to manage your weight. Again, it’s this false notion that fat people cannot eat fat! The fats in this tapenade are plant and fish fats, the unsaturated fat that has the essential fatty acids or omega 3 fats that we NEED to manage our weight. Most people eat far too many saturated fats and not enough of the plant and fish fats. It is precisely because this olive tapenade recipe is rich, filling and delicious that you can eat it and still manage your weight. Eating foods with plant and fish fats along with a lot of high fiber foods will help you to feel satisfied and reduce cravings. It is one of the omega 3 foods that helps you to burn fat. Return from Olive Tapenade Recipe to Low Glycemic Recipes. Return from Olive Tapenade Recipe to Lifetime Fat Loss home page.